In a move that makes networked audio even more accessible for both professional and home studios, Focusrite recently announced two new audio interfaces, the RedNet X2P and Red 16Line Audio Interfaces. Let's take a closer look at each interface. The compact Rednet X2P is a 2-in, 2-out Dante audio interface featuring two Red Evolution mic pres, stereo line out and a stereo headphone amplifier. The RedNet X2P can be used as a desktop audio interface connecting to your computer with a single Ethernet cable — no power supply required — but it really comes into its own when added to a larger Dante audio-over-IP system. 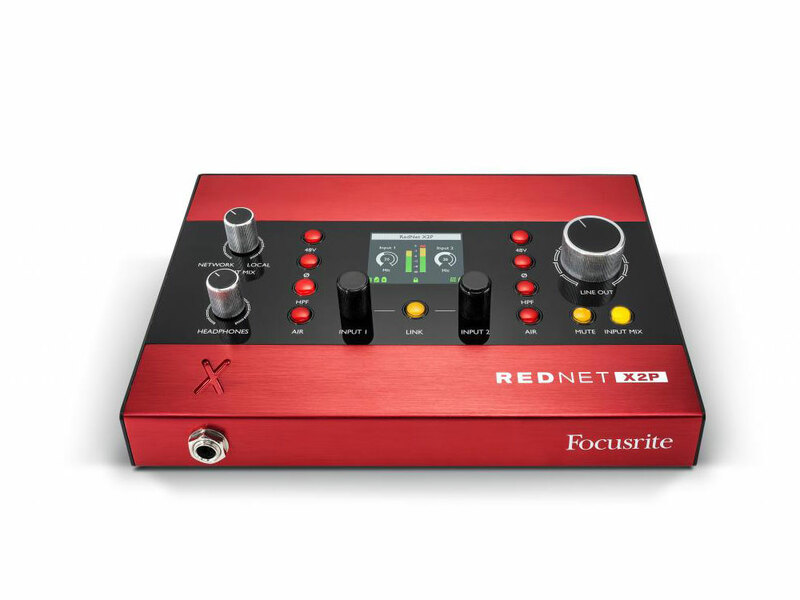 RedNet X2P quickly adds I/O to Focusrite Red interfaces or any Dante audio-over-IP system. A local input mixer allows 'more me' monitoring control, while a control lockout ensures settings remain unchanged when used remotely by artists. The two digitally-controlled Red Evolution mic pres provide plenty of gain along with stereo linking, individual phantom power, a high-pass filter and phase reverse. Plus they include Air mode, emulating the sound of Focusrite’s classic transformer-based mic preamps. RedNet X2P provides audio conversion with over 118dB dynamic range. The converters have been expertly selected and calibrated, say Focusrite, to provide the best balance of sound quality, dynamic range and conversion latency. In addition, the RedNet X2P features a crossfader to enable control of the level of local inputs versus network inputs that feed either the line outputs or the headphone outputs. The unit can be mounted directly to a mic stand, keeping it out of the way and within reach. You can preorder Rednet X2P from RSPE today! 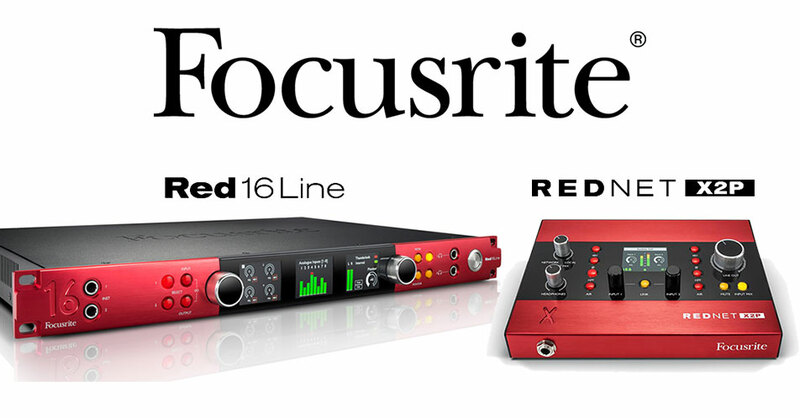 The Focusrite Red 16Line is a 64-in/64-out Pro Tools | HD and dual Thunderbolt 3 audio interface with ultra-low latency A-D/D-A conversion, Red Evolution mic preamps, up to 121dB dynamic range, and expansion over Ethernet for networked audio. Since Red 16Line provides both DigiLink connectors and Thunderbolt connections, it's now easier than ever to switch from Pro Tools | HD to other audio applications, without the need to reconfigure option cards in the interface. The host mode can be simply changed either in the remote control software, or on the device front panel to change DAWs in seconds, claim Focusrite. The Red 16LIne sports high-performance audio converters boasting over 118dB dynamic range A/D and 121dB dynamic range D/A (A-weighted). Also, for those used to having to build two different mixes – one using input monitoring to overdub, the other using the DAW for playback – the good news is that now, one is enough. According to Focusrite, the low latency performance is such that mixes can be built on the DAW and used whether overdubbing (monitoring the input being recording with the Focusrite Control software mixer) or playing back, with all plug-ins in place, all the time. 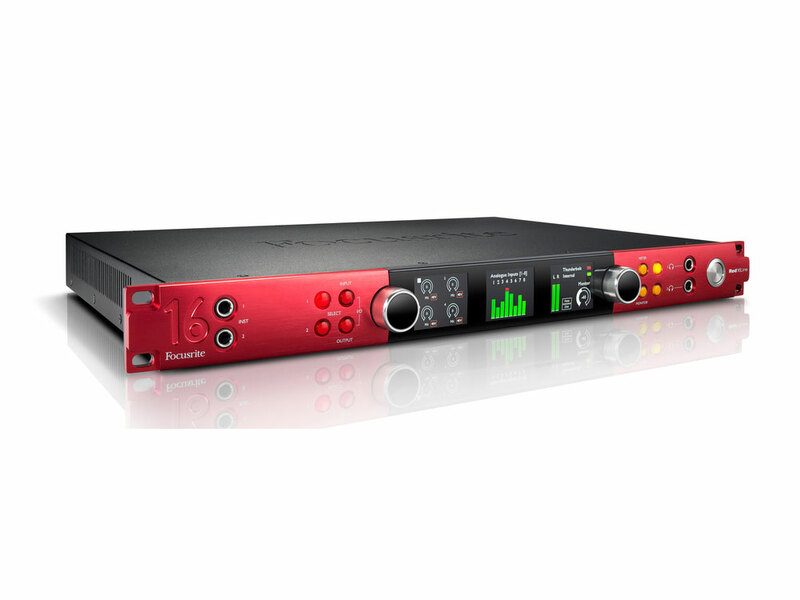 Red 16Line features 16 line inputs on D-sub, coupled with 16 line outputs and two main monitor outputs, and the outputs can be ganged for surround monitoring applications. It also features two digitally-controlled Red Evolution mic preamps, the same as the RedNet X2P.